The Great Barrier Reef lies off the coast of northern Queensland. It is the world’s largest coral reef system and one of the world’s great natural wonders. In this podcast I would like to tell you a little about this amazing natural marvel. The Great Barrier Reef stretches over a distance of around 2300km down the coast of northern Queensland, starting from near the tip of Cape York, Australia’s most northern point, going down to the town of Bundaberg, which is around 360km north of Brisbane. The reef lies close to the coast, sometimes only 15 kilometres offshore while at other times it is around 150 kilometres offshore. It is made up of around 3000 separate coral reefs and makes up 10% of the world’s coral reefs. An interesting fact is that it is the only living thing which can be seen from space. The reef and the islands within it are an incredibly beautiful and rich environment. It contains more than 400 types of living coral, around 1500 different species of tropical fish, over 200 species of birds and around 20 types of reptiles including turtles, sea snakes and crocodiles. The colours of the coral and the underwater life have to be seen to be believed. There are over 900 islands and cays. The Great Barrier Reef is a precious world resource. In a sense, it belongs to the entire world and Australia has the responsibility of looking after it. To show how important it is for the world, UNESCO listed it in 1981 as a world heritage site. This means that its importance to humanity is recognized by the United Nations and it is agreed that it must be protected and preserved. Australia’s government and Australians understand this and we take our responsibility very seriously with regard to protecting the reef. In 1975, to help protect and preserve the reef, the Australian Government created a special marine park which covers most of the area occupied by the reef. To manage the park, and hence protect the reef, a special organization was created. It is called the Great Barrier Reef Marine Park Authority and it is controlled by the Federal Government, in partnership with the Queensland Government. The Authority protects the marine park and the reef by creating rules and regulations which all users of the marine park must follow. It also monitors what is happening within the park to make sure that the marine park and the reef remain protected, while still allowing people to enjoy the wonderful sights of the reef and enjoy the reef environment. It issues permits to companies and other groups so they can use the park while following all the rules designed to protect the reef and its environment. It also has a key role in educating everybody about the marine park and the reef, so that activities by humans on and near the reef are properly controlled. The reef certainly needs to be protected, so the authority has a very important job to do. The main dangers to the reef are from human activity, although there are also some natural dangers to the reef. For example, large ships must navigate through that area and it would be so easy for the reef to be damaged, especially if a ship was to run aground and possibly spill oil or fuel which would damage the reef. Ships must only use approved routes through and near the reef, which helps to reduce the risk of an accident. There are also special ships’ pilots, who can guide visiting ships safely through the reef if required. Despite that, there have been around 1600 ship wrecks in or near the reef. The last one occurred in 2010 when a large ship ran aground, spilling oil onto the reef. Another danger to the reef is from tourism. Every year around 2 million people visit the reef. I’m not surprised that so many people go to the reef, not only Australians but also people from all over the world. After all, it’s a beautiful place so it’s important that people can go there to experience it. But when so many people visit one place, there is a real danger that it can be damaged. Imagine if each person took away a small piece of the reef as a momento. Very soon the reef would be destroyed. To help prevent this, the entire reef has been divided into special zones. When you are visiting the reef, you need to follow the rules about what you can and can’t do in each zone. It is said that the best things to collect from the reef are memories and photographs – that way the reef will be preserved for future generations to enjoy. There are also many rivers which flow into the sea adjacent to the reef. As you might expect, pollution from these rivers in Northern Queensland is also a concern for the reef. These rivers pass through farm lands where fertilizers and insecticides are regularly used. Of course, some of these chemicals will be washed into the rivers and end up in the ocean around the reef, especially after periods of flood. These chemicals can actually kill the coral so this is something which the government and the Great Barrier Reef Marine Park Authority are helping farmers to reduce, so as to keep the reef healthy. Another impact on the reef is climate change. As the temperature of the ocean slowly increases, this affects the health of the coral and can make them turn white, a process called bleaching. Bleached coral can die so this is a major concern. 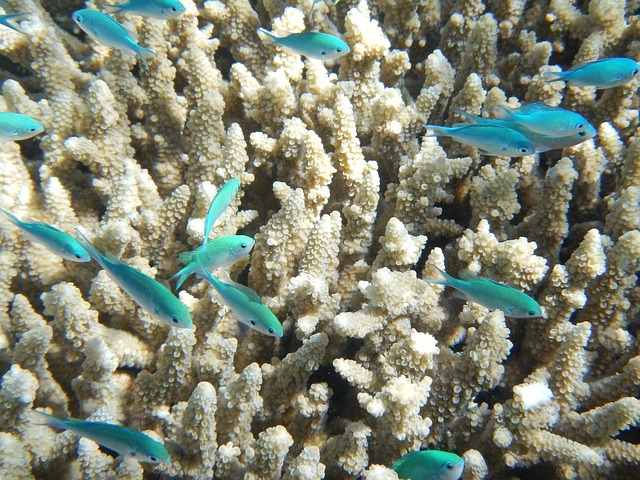 The Great Barrier Reef Marine Park Authority has a plan to help make the reef more resilient to climate change. In addition to the effects from human activities, the reef also has a natural enemy – the crown of thorns starfish. This large starfish loves to eat coral and an outbreak of starfish can quickly destroy a coral reef. The Great Barrier Reef Marine Park Authority has a program to remove and control these starfish. This will require continuing effort into the future. Incredibly, like many Australians, I have not yet seen the Great Barrier Reef. I do have friends who have visited North Queensland and who have taken a trip out to the reef. They say the beauty of the reef and its amazing abundance of sea life is something really worth seeing. One day I will make the journey and see it for myself. Podcast 93 Quiz - Did you understand the podcast? True or False? – The Great Barrier Reef starts near the tip of Cape York and stretches down to Bundaberg. True or False? – The Great Barrier Reef lies about 360 kilometres off the coast of north Queensland. True or False? – If you want to see many types of tropical fish, then the Great Barrier Reef is a great place to visit. True or False? – The Great Barrier Reef Marine Park Authority has been created in order to help protect the reef. True or False? – The rules and regulations about the use of the Great Barrier Reef do not apply to Australians. True or False? – Tourist activities on the Great Barrier Reef are controlled so that the reef is protected. True or False? – The best things tourists can take away from the reef are memories and photographs. True or False? – Floods in Queensland have no impact on the reef. True or False? – Luckily, climate change has no effect on the Great Barrier Reef. True or False? – The crown of thorns starfish can destroy a reef and must be controlled.